Black Democrats were nearly twice as likely — 28 percent versus 15 percent — to prefer Biden over Sanders. Rep. Beto O’Rourke was the first choice of 8% of Democrats, followed by Sen. Elizabeth Warren (D-Mass.) with 5%. As Democrats seek out a new candidate to take on President Donald Trump in 2020, their minds are falling back on some old names. A new Morning Consult/Politico poll found that former Vice President Joe Biden was the first choice of 26 percent of Democratic voters for the party’s nomination, followed by Vermont Sen. Bernie Sanders, who was preferred by 19 percent of Democrats. Overall, 31 percent of Democrats listed one of 18 other potential candidates polled as their top choice, while 21 percent said they didn’t know or had no opinion and 3 percent said “other,” a sign that the fight to be the party’s next standard bearer is wide open if neither Biden nor Sanders run. Black Democrats were nearly twice as likely — 28 percent to 15 percent — to say Biden is their first choice, while Sanders held an 8-percentage-point advantage with the country’s youngest voters (29 percent versus 21 percent). While neither held a significant advantage with men, Biden led Sanders with women by 11 points, 28 percent to 17 percent. Biden has run for president twice — first in 1988 and more recently in 2008 — and Sanders, the country’s most popular senator among his own constituents, exceeded expectations despite an ultimately unsuccessful challenge against Hillary Clinton for the party’s nod in 2016. They appear to be benefiting from higher name recognition at this early stage of the 2020 presidential conversation. Fresh off another campaign that exceeded expectations and energized Democrats nationally, Rep. Beto O’Rourke was next in line, securing 8 percent of first-choice status among Democratic voters after losing to Sen. Ted Cruz (R-Texas) last week. Sens. Elizabeth Warren (D-Mass. ), Kamala Harris (D-Calif.) and Cory Booker (D-N.J.) followed the Texas Democrat in the list, with 5 percent, 4 percent and 3 percent backing them, respectively. One percent each picked three other senators who are also potential candidates: Minnesota Sen. Amy Klobuchar, New York Sen. Kirsten Gillibrand and Ohio Sen. Sherrod Brown, who opened the door to a potential presidential run during an interview published Monday with the Cleveland Plain Dealer. Zero percent of Democrats said their first choice for president was former Attorney General Eric Holder, former Massachusetts Gov. Deval Patrick, Stormy Daniels’ lawyer Michael Avenatti or Rep. John Delaney (D-Md. ), who back in July 2017 was first to declare his candidacy for the party’s nomination. While Biden and Sanders are seen to represent different ideological poles for the left, the survey suggests that’s not top of mind for voters when thinking about 2020. 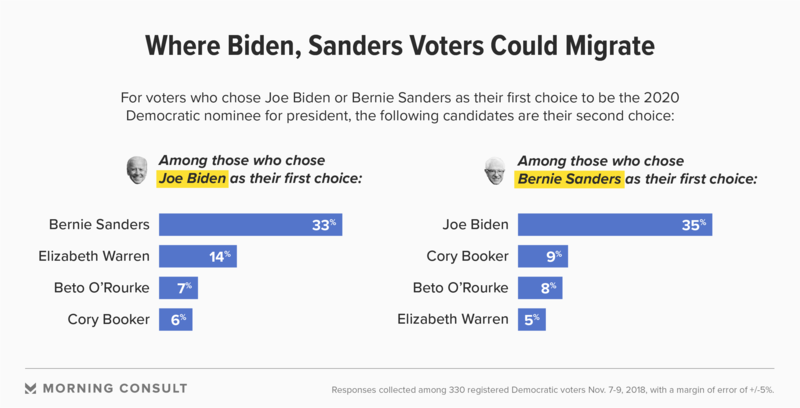 A 35 percent plurality of voters who preferred Sanders said they’d opt for the less liberal former Delaware senator as a second choice, and 33 percent of Biden first-choicers said they’d back the democratic socialist firebrand from Vermont second. Nine percent of Democrats said Warren was their second choice, and voters who preferred Biden were more likely than Sanders’ backers to choose Warren as their second choice, 14 percent to 5 percent. Overall, 11 percent of Democrats said they did not know who their second choice was, and 8 percent said “other,” writing in names such as former first lady Michelle Obama, Tallahassee Mayor and Florida gubernatorial candidate Andrew Gillum, actor and former pro wrestler Dwayne “The Rock” Johnson and media mogul Oprah Winfrey. The national survey of 733 Democratic voters was conducted online Nov. 7-9 and has a 4-point margin of error.